Great White Butterfly – not pretty. Federated Farmers has put out a warning about a significant new pest threat – the great white butterfly. It is a significant pest of brassica vegetable crops. Its caterpillars feed voraciously on host plants reducing them to a skeleton. In New Zealand, it poses a major threat to commercial and animal forage brassica vegetable crops. It could also have serious consequences for the survival of many of New Zealand’s 79 native cress species. 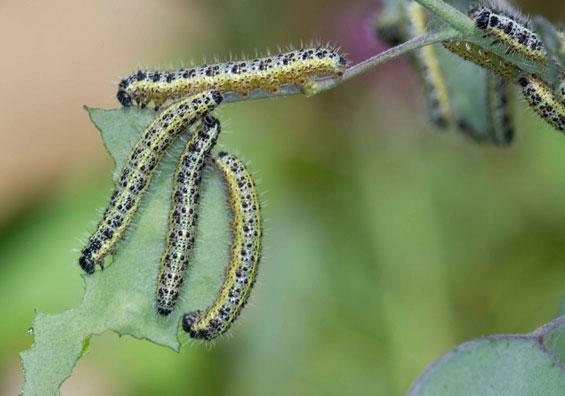 Its caterpillars and eggs are found in clusters on host plants, particularly nasturtiums, honesty and brassica vegetables. To identify it, please look here. The caterpillars become more visible in their later larger stages when they are speckled greyish-green and black with three yellow lines along the body. The larger caterpillars have lots of pale hairs. Fully-grown caterpillars are 50 mm long. In contrast, the small white butterfly caterpillar is uniformly green with a faint yellow line along the top of its body and grows to about 30 mm long. If you suspect an infestation call the Ministry for Primary Industries (MPI) on 0800 80 99 66. The great white butterfly has been spreading since it was first found in a Nelson city garden in 2010. The butterfly species can fly long distances, sometimes hundreds of kilometres, so will spread throughout New Zealand unless stopped. Public and farmer help in looking for and reporting infestations is essential if this pest is to be eradicated.